Stories continue to circulate about the connections of Panama politicians to a recently arrested drug lord, living openly in luxury homes in Clayton and Punta Pacifico and President Varela sidesteps questions saying: “name names”. The first time I found a historical narco-political trail in the republican life of the Isthmus of Panama was when I was exploring the newspaper library of the University of Panama. I found in the memoirs of the Ministry of Government and Justice of the second decade of the last century, a naive mention of an official who had participated in some operation to capture opium one of the popular smokes of the time. The official, very proud of his action, wrote to the minister informing him of how local politicians had mediated to avoid the operation. I searched anxiously in the record of the ministry, to see if the official of yore had been dismissed, but to my surprise, that information was not in that document. Army pot growers In World War II, the American soldiers stationed at the Clayton base had marijuana plantations, which were regularly destroyed, but for some reason, Cannabis was not lacking. The well-known plantings in Isla del Rey, which became world famous as "Panama Red" were followed by other marijuana plantations on the island of Coiba, which were harvested by the prisoners and subsequently sold by some contacts of the commanders of the National Guard. Each government of the Panamanian democratic period has had its scandals linked to the narco-politics. The name of José Antonio Remón Cantera and his assassination on January 2, 1955, has always been surrounded by the breath of an "adjustment of accounts" or the collection of old drug trafficking quarrels. The linking of the uniformed with drug trafficking is probably 100 years, from the opium dens to the modern drug trafficking logistics, none of these activities would be possible without a degree of complicity or participation of the Public Force. Each government of the democratic period has had its scandals linked to the rugged issue. For example, how many millions of dollars in cash were seized in the Edicano printing press during Guillermo Endara's government? How much did José Castrillón Enao donate to Perez Balladares' presidential campaign? Funds from the FARC in Panama during the government of Mireya Moscoso?, what happened with Inspector Franklin Brewster and with the funds of David Murcia, in the government of Martín Torrijos?, and what has happened with a large number of high-ranking officials of all the security forces detained for links with drug trafficking? Colombia produces more than a thousand tons of cocaine annually. There are no exact figures of how many of these tons pass through Panama. The average annual catch of the last decade has been around 50 tonnes. With each capture come arrests and cautions of assets. Trapped cocaine moves by car, by container, by boat, by human mules, and even by airplanes. In vain, prisons are filled with people who had their stomachs loaded with tablets with drugs, or who lined their bodies or prepared to load luggage with drugs. 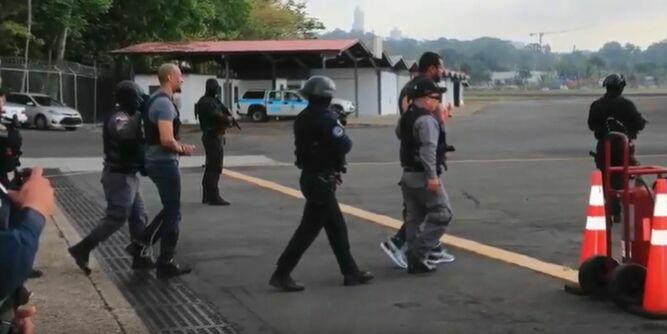 It does not make sense to capture these people at the Tocumen airport or at the ports of entry if proper follow-up is not done to find the next link in the narco-chain. Once, the police proudly displayed the arrest of two foreigners who came with suitcases loaded with cash, with the mission of laundering them in the local bank. It would have been so easy to follow up to know that the bank, casino, hotel, law firm and other substitutes were going to facilitate money laundering. Any tour of our provinces runs into farms, beach houses or mountain homes that are properties of politicians and others, without who a decent trade or a family business that would have justified so much prosperity. To the embezzlements that were never investigated, to the traffic of influences that was never regulated, or to the sale of laws, administrative decisions or judicial decisions that built bad fortunes everywhere, it was natural that drug trafficking was added. The Panamanian State abandoned public services and the presence in the streets of officials other than the police. For more than 30 years, the red zones have been fertile ground for all types of crime. The State has become an accomplice of gangs and drug traffickers. The Punta Coco prison exists because all the other prisons are penetrated by corruption. Some of the heavy weapons that have fallen into the hands of the gangs come from the armories of the security forces. Even Austrian pistols, manufactured for the Panamanian security forces, have ended up in the hands of third parties, who use them with pride despite the official shield that decorates them. The complaint of the US feds and the local police was that the Colonists had changed the logistics of drug trafficking. Who are the mediators between the State and the community? Deputies and corregimiento representatives act as intermediaries that facilitate the supply of public goods, jobs, scholarships, housing, food bags, and other benefits. The gangs and narcos seek the protection of political power to neutralize the power of the State. In other words, narcopolitics is an action by which public servants betray the State to serve other purposes. As with all forms of corruption, the State always loses. In 1993 when I arrived in the United States for my postgraduate studies, I met a friendly Puerto Rican family who were mostly police officers. From time to time, they told me their stories of combat with urban gangs, which dominated the organized crime of a part of the North of the United States. They talked to me about how hard the Jamaican or Dominican gangs were. I was surprised when they informed me that the hardest among the hard guys came from Colón. I thought that this was one more anecdote of the Panamanians in the world, but I came back to find the subject of the Colonist gangs in Chicago. The complaint of the federal and local police was that the Colonists had changed the logistics of drug trafficking. I was presented with a ploy in which borrowed babies were used that were taken by their alleged mothers, by plane from Panama, and the drug was carried in liquid form in bottles. More sophisticated versions of this story began to be told in Spain and the Netherlands. The Colonists improved the logistics of drug trafficking and control much of the coca that enters Europe.